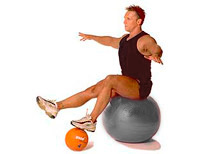 Sit on Swiss Exercise Ball with neutral posture, arms extended on either side of you and medicine ball on floor at your feet. Lift both feet off floor and place right foot on medicine ball. Hold and release. Repeat other side.